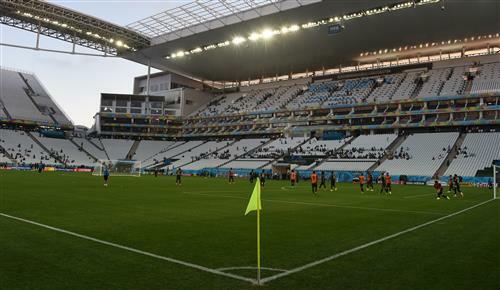 CNN brings you all of the action from Brazil as the hosts kick off the 2014 World Cup against Croatia in Sao Paulo. "Let me tell you the time has arrived. We are going together. This is our World Cup." For the first time in 64 years, football has come home. Sure, Brazil might not have invented “the beautiful game,” but it has done more than any other country to make the World Cup the greatest sporting event on the planet. Tonight, in the city of Sao Paulo, the five-time world champions kick off the 2014 tournament against a backdrop of fervent expectation and protests on the streets. 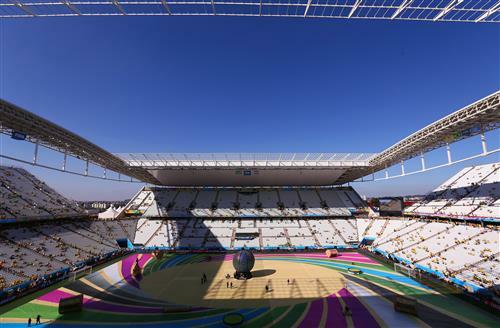 Croatia is the opponent for the opening match of Group A at 1700 local time; I’m Tom McGowan and alongside Chris Murphy I’ll be guiding you through the opening day of this samba celebration. There are 64 matches involving 32 countries to look forward to across 12 venues -- that’s 5,760 minutes of soccer without even taking extra time into account. Brilliant, isn’t it? Kicking us off in a blur of yellow tonight will be host nation Brazil, and the poster boy of this World Cup -- Neymar. The Barcelona striker carries the hopes of a nation on his shoulders, expectations only heightened by his fine showing in last year’s Confederations Cup -- which Brazil won. Lying in wait for them this evening are Croatia, who boast the talents of Real Madrid’s Luka Modric and soon-to-be Barcelona signing Ivan Rakitic. They will desperate to spoil the show in Sao Paulo that starts at 1700 local time, 2100 BST and 2200 CET. Where it all begins, the Arena Corinthians in Sao Paulo. As ever, we want you to be an integral part of our coverage and there are all sorts of ways to get in touch with us, first and foremost on Twitter and Instagram via @CNNFC using the hashtag #CNNWorldCup or through our CNNFC Facebook page. We want to know how you are going to devour this upcoming feast of football, who you are supporting, where you'll be watching and who you think will the World Cup. Get in touch and let's do this thing together. 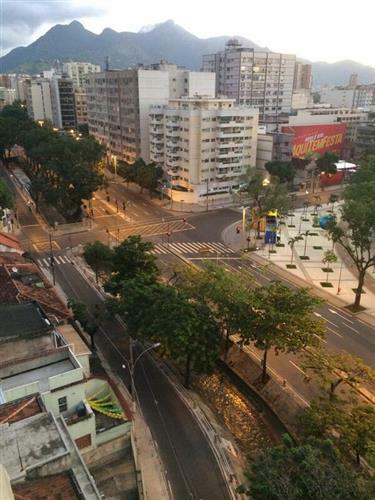 While football fans eagerly await the action on the pitch, ugly scenes of protest have been coming out of Sao Paulo. 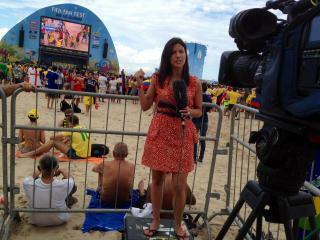 Some Brazilians are angry with the level of public spending on the tournament, with CNN's Shasta Darlington caught up in clashes between police and demonstrators earlier today. For the latest on the protests, click here. On that theme, here is an examination of who the winners and losers will be from the 2014 World Cup in Brazil by CNN's Eoghan Macguire. 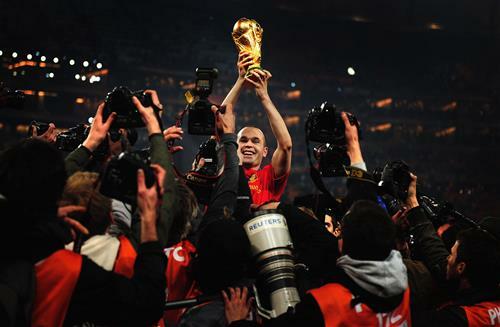 Andres Iniesta - World Cup winner. This one is wide open. Even without star striker Falcao, Colombia will fancy their chances of topping the group with supreme talents James Rodriguez and Jackson Martinez in their squad while Didier Drogba and Yaya Toure carry Ivory Coast's hopes of getting out of the group stages for the first time. Euro 2004 winners Greece can always hold their own but have only won one World Cup match; Japan have twice made the last 16. 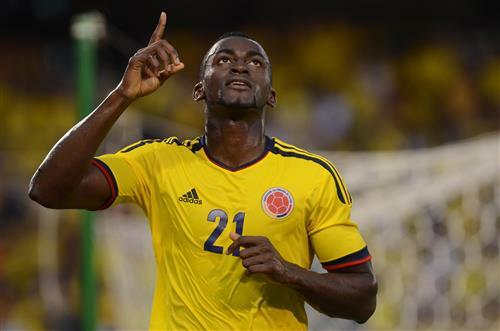 Star man: Jackson Martinez is a powerhouse striker and should help Colombia into the last 16. Verdict: Colombia first, Ivory Coast edging out Japan in second. Jackson Martinez is the main man for Colombia in Falcao's absence. We're counting down to kick-off but there is still time to get in touch and tell us your predictions, send us a World Cup shirt selfie, or let us know where you are watching from. 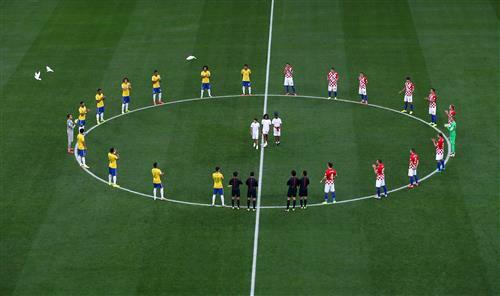 The teams are in the tunnel and the World Cup 2014 is moments away. Excited? You bet. This moment of quiet contemplation before an eruption of color and noise is a little too much for Thiago Silva, who has tears in his eyes. This is what it means to the players. The Croatian anthem is first and well respected by the home support, before they get the chance to belt out their own. The players take the lead, each one of them singing loud and proud. Half of them have their eyes closed, David Luiz bellows it out like it is the last song he'll ever sing and a huge roar greets its conclusion. There's no disharmony in this stadium. It just got real, THE WORLD CUP IS ABOUT TO START! It's a predictably frantic opening few minutes, Kovacic firing wide with the first attempt on goal. Neymar's first touch is cheered but then Luiz is forced to clear from a dangerous Olic cross. A free-kick to Brazil on the left flank is whipped in by Marcelo and after it is nodded back across goal, Luiz gets a header in that bounces gently into Pletikosa's grateful clutches. What a scare for Brazil! Olic really should score with a header from Perisic's brilliant right-wing. cross. Cesar was scrambling but it flashes past the post. Croatia have started the brighter here. Thiago Silva almost crying in the tunnel. Emotions coming to the fore. 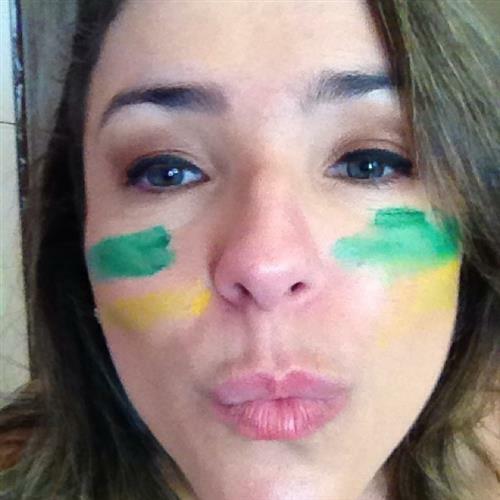 Watch the Brazilians sing the national anthem. Real passion. 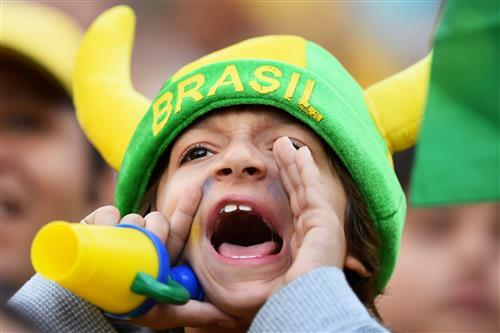 A young fan offers some tactical advice to Brazil's players. Disaster for the hosts! A low ball from the left by Olic is scuffed by Jelavic but his effort flicks off Marcelo and flashes into the net. 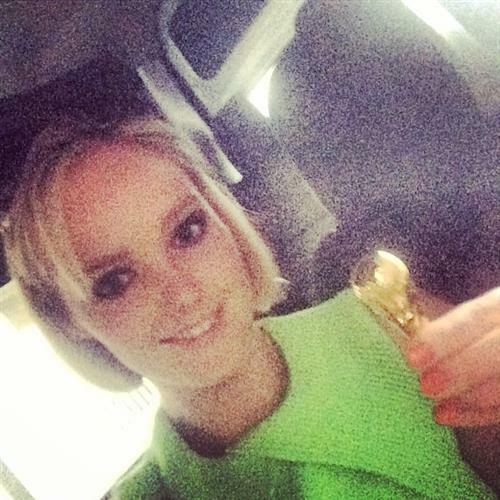 The hosts are behind inside 15 minutes of the World Cup. That was not in the script. How will they react? 1 - That was Brazil's first ever own goal in a #WorldCup game. Calamity. Nearly an equalizer for Brazil as Oscar swings in a delicious cross from the right -- the sort you'd want to ask out for a date -- but a sprawling Neymar can't get anything on it at the back post. That has livened the crowd up a little after they went quiet in the aftermath of Croatia's opener. 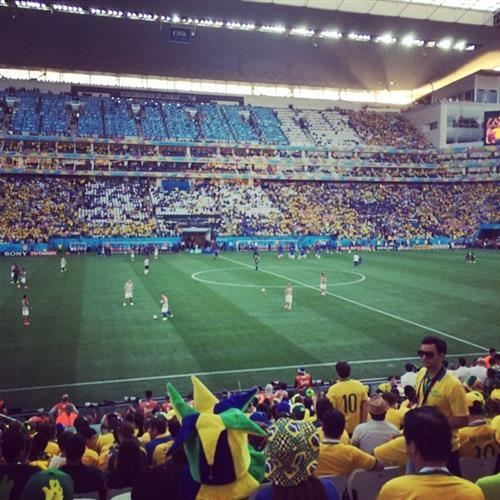 Still a rather subdued atmosphere inside the stadium, despite a flurry of Brazilian attacks. The home side are pressing forward but Croatia look dangerous on the break. Just as I say that Paulinho is played in by Oscar but his shot is right at Pletikosa. That's more like it from Brazil and Neymar was at the heart of it; he dances past Rakitic and gets to the byline, his cross is cleared but then Oscar returns it with interest from 20 yards out -- Pletikosa hurling himself across goal to save. Hulk then blazes over. Neymar, the golden boy of Brazil, is booked as his arm catches Modric. They were both looking at the ball as it sailed towards them. Croatia's players argue it should have been red, Brazil's players respond and we have our first slice of needless World Cup shoving.